Giant both builds new and retrofits existing freight boxes to customer specifications. Think roll-up or sliding doors, windows of any shape and size, skylights, electricity, etc. Standard sizes range from 10 feet to 45 feet. According to Kroft, a retrofit order can be completed in under three weeks. 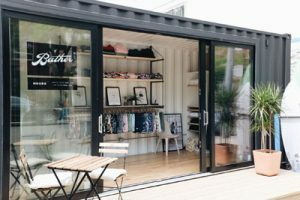 The company also offers a large fleet of modified containers that rent out for the perfect pop-up venue, whether it be as an information kiosk, café, bar, experiential activation, temporary shop and more. The sky’s the limit for the in-house design and production team, conjuring up all sorts of cool container customizations and looks. They can also do the vinyl-wrap branding work in-house or apply customer-supplied graphic decals.